Well, it's not a very good album at all, is it? 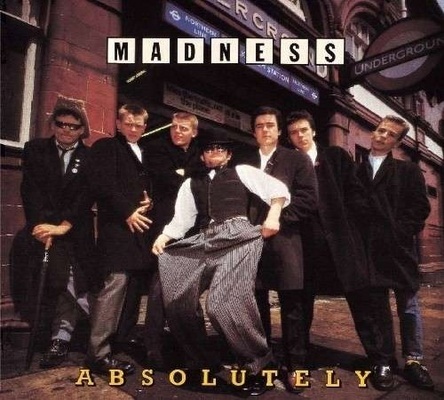 It's not even the best Madness album, but it was the first pop album I really liked - I probably should mention that, really. When I was a kid I used to listen to soundtrack records. I didn't really like pop music until 1981. My dad was going out with this woman and I went round to see him, and she gave me a cassette of this Madness album which had just come out, and it had 'Baggy Trousers' on it. It had a certain air of the forbidden about it, I suppose, because there were songs about kids being naughty at school and stuff. But it was good because it took you backward into listening to punk. It also took you way back into listening to ska and old reggae, and Mod British bands like the Kinks, so it spread you out into lots of stuff. Within six months they were also the first live band I'd ever seen. It was really exciting being 12 or 13 and seeing Madness, although years later I met Chas Smash from Madness, or whatever his name is, Carl Smyth I think. I said, 'You're the first live band I ever saw, in 1981, Bigby Hall, Birmingham.' He said, 'Oh, that was really great that gig wasn't it? Me, a Jewish man on stage in front of hundreds of skinheads sieg heiling me.' It must have been really weird being in Madness at the period. Like Sham 69, they got this inexplicable National Front following. Being a teenager in 1980/81 it was incredibly partisan - you had to choose which tribe you belonged to and then you had to dress very carefully wherever you went. If you went to see Madness you couldn't look like you were a rocker because you'd get beaten up. You'd probably get beaten up anyway. Anyway, it's not a great album, but it really was the gateway to other pop music, and a great one to get into first of all because of all the little tributaries that come off it.